With the fast development of iPhone, more and more people would like to use iPhone to watch videos at any time of the day. When you download or store some MP4 files in your computer, and you want to have fun with them by using your iPhone, you have to transfer MP4 to iPhone for your convenience. Here, I will show you four ways to solve this issue. If you want to transfer MP4 to iPhone, the easiest way is to use email. The whole procedure to save MP4 to iPhone is really quite simple. At least, you need to register an email account for your convenience. The following steps will set “gmail” as an example to show you how to save MP4 to iPhone via email. Let’s have a look. Step 1: Open your browser on your computer and log into your mail with email account and the password. 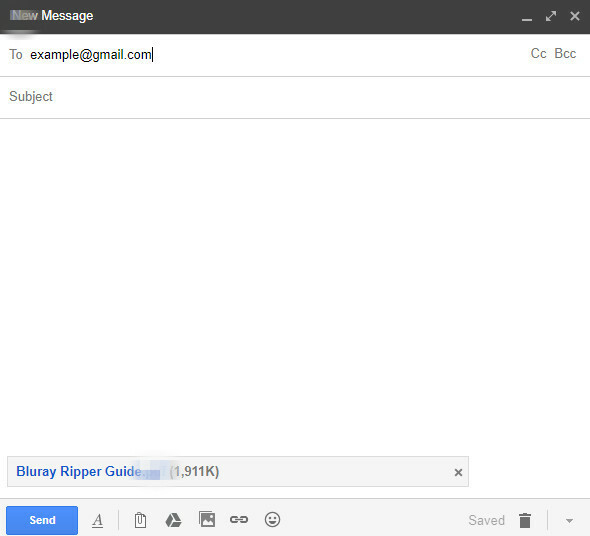 Step 2: Tap “COMPOSE” button to make a new email and then tap the attachment button and attach the MP4 file from your PC, and send the mail that has been newly created to another email account of yourself on your iPhone. You can also save the newly made email as a draft. Step 3: Log in your email account on your iPhone to receive the newly composed and sent email which has the MP4 file as an attachment, or enter into the draft panel to view the newly composed and saved mail draft. 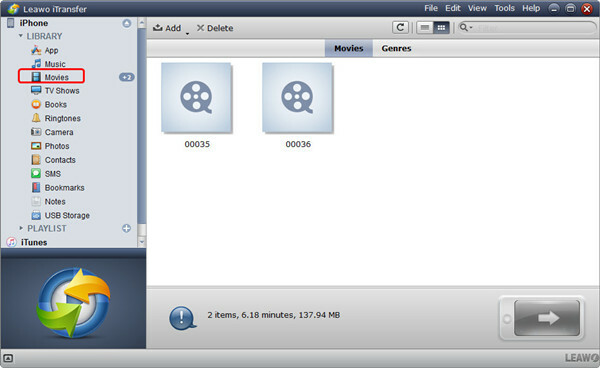 Step 4: Open the MP4 file attachment and finally you can select to save MP4 to iPhone. This is the most convenient method to transfer MP4 to iPhone via email, but it has a big disadvantage: the size of MP4 files may be limited due to various mail services. 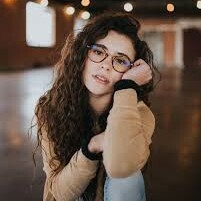 And the speed of transfer process is restricted by the performance of Internet connection very much. Therefore, I will introduce 3 other methods to copy MP4 to iPhone to solve the problem. To download MP4 to iPhone with iTunes is also a good method. As is known to all, iTunes is put forward by Apple as the official iOS data management software. It allows you to sync videos between iPhone and iTunes. You should make sure that you have installed iTunes on your computer. The following steps will instruct you on how to copy MP4 to iPhone via iTunes in detail. Step 1: Open and launch your iTunes and plug your iPhone in with matched USB cable to connect to your PC. On the interface of iTunes, tap “File” and then click “Add File to Library”. Step 2: After you save MP4 to iPhone to iTunes, you need to tap the iPhone icon on the bar of the sub-menu. Open your iPhone and click “Settings” and then tap “Movies” panel in order. 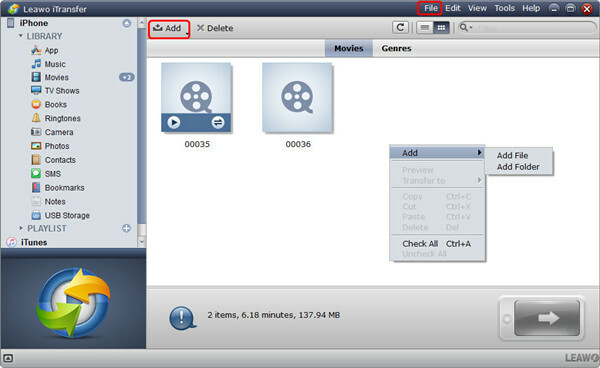 Step 3: Tick “Sync Movies” option on the right menu and then select the MP4 files you would like to transfer to your iPhone. Step 4: After you select the MP4 files, tap “Apply” on the bottom right corner of the interface to begin to sync MP4 to iPhone. Step 5: Wait until the synchronization process is finished. Finally, you can watch the MP4 on your iPhone happily and freely. The process is not difficult and great for you. Have a try and you will find it is really a nice way to save MP4 to iPhone. In order to assist you to transfer MP4 to iPhone with no limitation, I would like to suggest you use Leawo iTransfer. This software is quite professional and can transfer MP4 to iPhone easily and accurately, which allows you to transfer files and data between iOS devices, iTunes and PC, view data and documents on iOS devices from PC, and so on. By applying Leawo iTransfer, you will have no limitation to save MP4 to iPhone. The first thing you need to do is download and install this software on your PC. 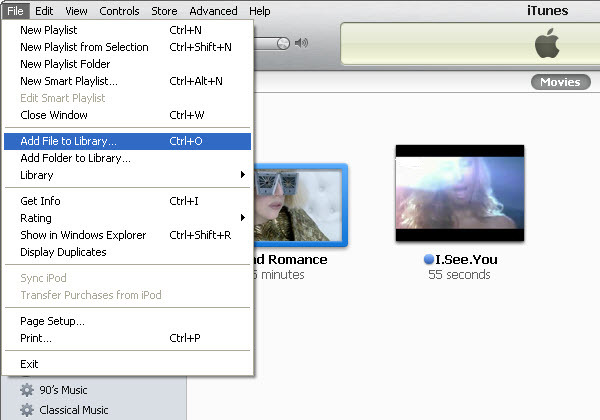 The following steps will display the specific steps to transfer MP4 to iPhone without iTunes. Open Leawo iTransfer, and then connect your iPhone to your PC with USB cable. You will see the information of your iPhone on the left interface. Tap “Movies” tab under the menu of “iPhone>Library” on the left side, and the contents will be displayed in the right side of the interface. 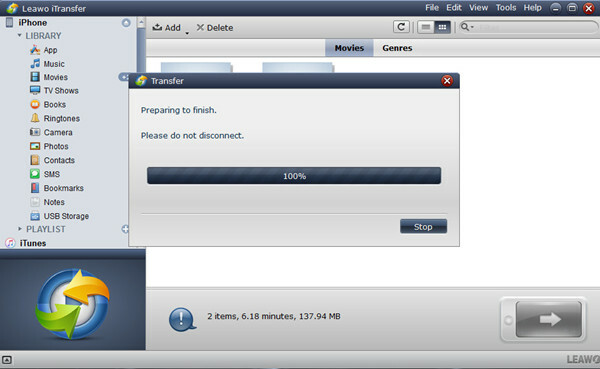 Step 4: Wait for Transfer to Be Completed. After selecting MP4 files, Leawo iTransfer will begin to transfer MP4 to iPhone from your computer. The procedure in the pop-up panel will display the process rate to you. When the transfer is completed, you can open the MP4 files in your iPhone. This method can solve the problem of “how to move MP4 to iPhone” perfectly without any limitation. You can now download this magic tool to help you save MP4 to iPhone from computer. The above three solutions can help you to transfer MP4 to iPhone without any difficulty. Besides, you can also use iCloud Drive to transfer MP4 to iPhone from computer. This solution can offer you more convenience. 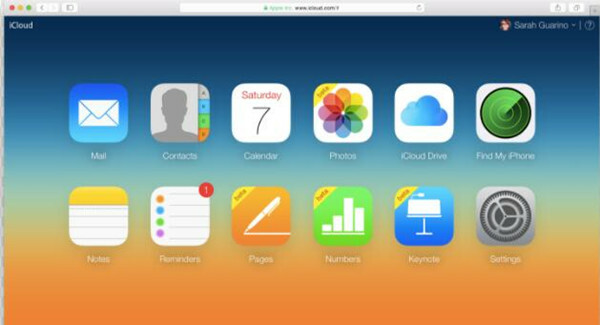 You need to make sure you have downloaded and installed iCloud Drive on your iPhone. The following steps will show you how to add MP4 to iPhone via iCloud Drive. Step 1: Go to iCloud.com on your PC, and then log in iCloud.com with the same Apple ID account on your iPhone. Step 2: After you log in the account, tap the iCloud icon to enter into the space of your iCloud Drive. Step 3: When you get access to your iCloud Drive space, tap the Cloud shaped upload icon to browse and upload MP4 from PC to iCloud Drive. Step 5: Click the MP4 file to open it and then call out the menu at the bottom of the interface, and you can see a share icon. Click the share icon and then download to your iPhone. This post has recommended you four best ways to solve the problem of “how to copy MP4 to iPhone”. Choose one method to try and you will know how convenient it is to transfer MP4 to iPhone. You don’t have to worry about how to transfer MP4 to iPhone any more.